General Shareholder’s Meeting on April 22. Neto is currently the president of Marcopolo, the Brazilian bus and coach manufacturer. opposition owing to the fact that this division was primarily responsible for the whole company operating at a profit. Last month Boeing announced B. Marc Allen, a Boeing executive, as President and Embraer airliner head John Slattery as CEO. Neto will now be responsible for the existing military aircraft and executive jet operations. three years, he has served as CEO of Marcopolo, in which he successfully led the company's transformation, generating strong sales growth and market value for the business. Previously, he was the CEO Americas for Mann+Hummel and President of Knorr Bremse (global leader in control systems for commercial vehicles), among other leadership positions. Pratt & Whitney will expand its global network of providers that maintain the company’s Geared Turbofan (GTF) engines to include Delta TechOps, the division of Delta Air Lines providing maintenance, repair and overhaul (MRO) services in North America. Delta TechOps will provide engine maintenance for PW1100G-JM and PW1500G engines. Through the EngineWise™ platform of services, Pratt & Whitney provides operators with a variety of aftermarket services designed to provide long-term, sustainable value. Delta TechOps will join other industry leading MRO providers located around the world that deliver high quality maintenance support to GTF engine operators. TurbineAero, headquartered in Chandler, AZ, has appointed the new Vice President Sales & Marketing leading their global sales team. Donna J. Chase joined TurbineAero after spending 32 years in the Aerospace/Aviation industry in a variety of leadership roles. The last 26 years of those years were at Honeywell Aerospace which included running a US$500 million global Business Aviation Aftermarket business, consisting of avionics, mechanical & electromechanical components, software solutions, and services. MTU Maintenance has signed a twelve-year GE90-115B maintenance contract with United Airlines. The fly-by-hour contract covers the maintenance, repair and overhaul of 49 engines powering the airline’s B777-300ER fleet and includes MTU proprietary repairs as well as engine trend monitoring. United Airlines is headquartered in Chicago, Illinois. The airline operates over 770 mainline aircraft. The aviation industry needs pilots. As industry leaders in commercial pilot training, AeroGuard Flight Training Center sets a higher standard for safety, quality of training, and career success. Their new Austin flight school is a critical part of helping to meet that demand. airlines, universities, and their students. TCI Cabin Interior has reached an agreement with Airbus to become a Bar Unit supplier of Airbus A350 XWB aircraft. TCI, will design, certify and manufacture A350 XWB Bar Units according to upscale requests of Airlines and requirements of Airbus. This agreement has been a critical milestone for TCI as being a supplier for Airbus. TCI Cabin Interior, joint venture of Turkish Airlines and TAI (Turkish Aerospace Industries), two major aviation companies of Turkey, was established to carry the strength and quality of the two exceptional companies into Aircraft Cabin Interiors industry. TCI is located in Sabiha Gokcen Airport of Istanbul. TCI produces Aircraft Galleys as current line of the products and plans to extend the product range with other cabin interior items in the near future with full support of the shareholders. Honeywell and Volocopter have signed an agreement to jointly test and develop new navigation and automatic landing systems for Velocopter's vertical takeoff and landing aircraft as the emerging era of urban air mobility moves closer to delivering a new breed of cleaner, safer and smarter air vehicles. This agreement launches Honeywell's extensive autonomous sensing and flight technologies, including inertial measurement units, attitude heading reference solutions and potentially other urban air mobility (UAM) innovations, into this rapidly developing transportation market. 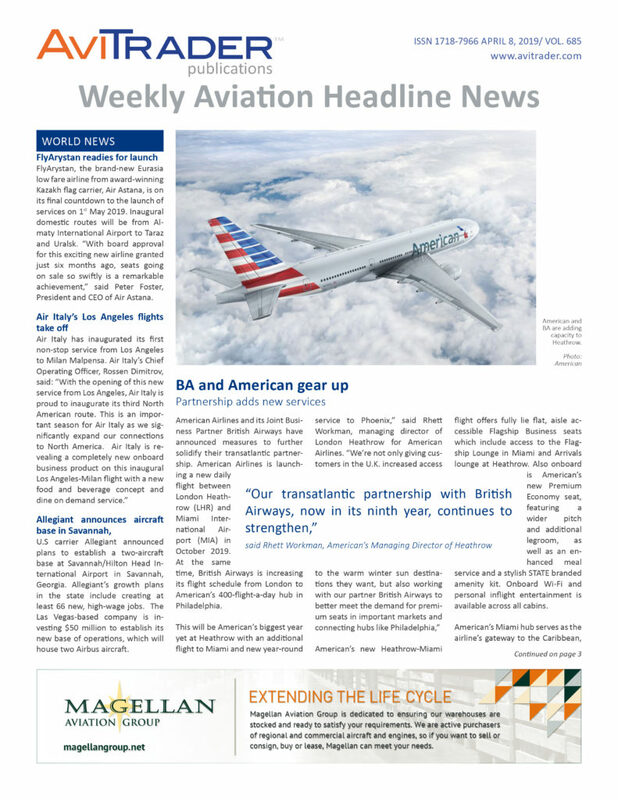 These solutions feature and build on technologies developed under Europe's Clean Sky 2 and Single European Sky Air Traffic Management Research (SESAR) 2020 industry and government collaboration programs. Honeywell and Volocopter aim to prove and mature existing technologies by testing and evolving various sensor-based navigation systems for use in fully-electric vertical take-off and landing aircraft. These tests will help the two companies create new technologies for urban air mobility. The new Mobile Engine Services repair station in Montréal is currently moving from inside Air Canada's facilities to new and independent premises. With more than 2,500 m² (27,000 ft²) of floor space and 12 bays, the new building will triple the site's operational capacity for surgical repair solutions on CFM56 engines. To support the capacity increase, Lufthansa Technik plans to expand its workforce in Montréal from today´s 30 to 80 by the end of 2021.
to its Tulsa repair and test cell portfolio, with production starting in July. First in the series will be the CFM56-5B, with initially three bays. As of today, Mobile Engine Services employs 42 mechanics in Tulsa. GA Telesis has reported the execution of a long-term agreement with JetBlue. The agreement, which began in December 2018, covers the repair and overhaul of a variety of components for JetBlue’s fleet of Embraer 190. 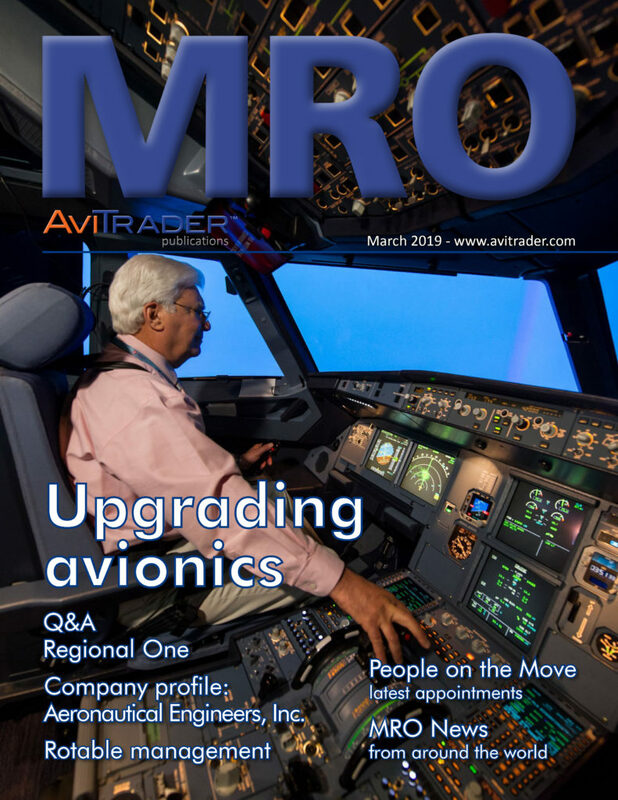 “We started working with JetBlue in early 2018 and our performance on TAT and reliability led to the execution of a long-term agreement,” said Pastor Lopez, President of MRO Services. Ethiopian Airlines, the largest Aviation Group in Africa, has established a new partnership with Immfly, an on-board digital transformation platform for in-flight e-commerce and on-board connectivity that enables airlines to digitally improve the passenger travel experience. across the globe, out of which over 60 are in Africa. Together with Ethiopian, Immfly will cover an extensive range of destinations across Africa, Europe, North and South America, Middle East & Asia. Immfly’s Connected Digital Services and IFE platform will be installed in 20 Ethiopian Airlines aircraft by this summer. The platform will be available in five languages including English, Amharic, Chinese, French, and Arabic to serve the distinct nationalities in the airline’s demographic profile.